Perhaps the worst thing about getting a puncture is the struggle with the awkward wind-up jack that is provided by the vehicle manufacturers along with the spare tyre. Finding the little slot in the chassis into which it must be inserted is bad enough. Then you have to remember how to unfold your little triangular or scissor shaped jack and wind it up, it can all be very stressful, especially if the weather is bad. 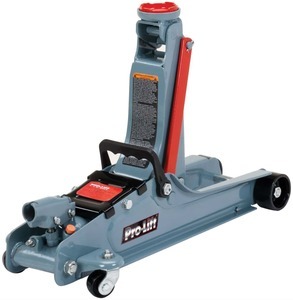 But when you can nowadays buy a compact pump-up floor jack for a relatively small amount and it is worth everyone’s while to keep such a floor jack in the boot of their car. What are the best low profile jacks that you can buy? To make siting this jack on the underside of your car that much easier, the saddle swivels 360 degrees to ensure that the contact is safe and secure to give you peace of mind. It only weighs 8.9 pounds, so it is easy to carry in and out of the boot. In spite of the jack’s light weight, its heavy steel frame is claimed to be very strong and long-lasting. Its minimum height is 5 inches, so before buying you need to check that there is enough room between the ground and the chassis frame, even when the tires are deflated. Extended height is 13.25 inches, so you also need to be sure that this gives you enough height for your specific car. This jack features a safety valve that is built in so that it isn’t overloaded, alongside a bypass device which will make sure that you don’t over pump the jack. Liftmaster have made sure that the jack will offer protection as well as simple usage. This weighs 30.9 pounds so, it is heavier to carry but still weighs less than the weight of a single piece of hold luggage on most aeroplanes. The heavier build makes it easier to pump up. There is a greater range of minimum height and maximum lift: 3.5 inches to 14 inches. So, this is more suitable for cars that sit low. In reviews people often comment that it works really well for lower vehicles. At 67.2 pounds, this is perhaps not quite so easy to carry in and out of the boot, and it is perhaps more suitable for the home mechanic or small garage owner. It is very compact so takes little storage space, but at the same time is very versatile. A dual pump makes for speedy operation and there is a nice long 2-piece, 45.3 inch handle to provide good leverage. Overloading is avoided with a special safety valve. Its minimum lift height is 3.5 inches and maximum lift height is 18.5 inches so fairly high vehicles can still be lifted with ease. Its recommends a maximum lift weight of 2 tons, which will happily cover most domestic cars on the market today. This is definitely one for garage use rather than carrying around in a car and the heavy-duty design will make it a useful tool for a long time to come. 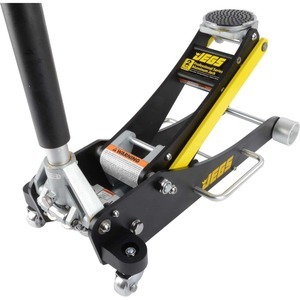 The weight of this model is 79 pounds which makes it the jack to use to if you are going to be placing jack stands under the car, although these are not included with the Pittsburgh and have to be purchased separately. The excellent range of lift makes the jack suitable for both low and high vehicles with a load weight of 3 tons. So, whatever rolls into your garage you know that you can lift it with ease, with the knowledge that you can work underneath in complete safety. We have a solid top of the range model here that comes in at the top of the price range for jacks. Although it weighs approximately 50 lbs, it is claimed to be able to lift 4000 pounds. So, it is just light enough to be able to carry in your vehicle if you want to and can raise a heavy pick up. However, it is more suited to be a garage or workshop tool. The range that this jack can lift is nothing short of amazing and it has the ability to slip under a lowered vehicle with ease. If you have a sporty little car in the driveway this could well be the jack you’ve been looking for. What do you want to do with your new jack? Do you want to have it with you in your vehicle or do you want to keep it in your garage? Is it for emergencies when you have a puncture or are you a professional or semi-professional mechanic, who will be making full use of it day in, day out? What can you afford? These are some of the considerations to take into account when you are contemplating the purchase of a new jack. This is the first thing to consider. 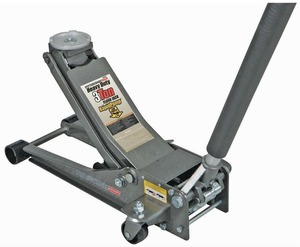 If you want to carry one in your car as an alternative to the old style wind up or scissors style jack, then weight is a very important criteria. You want it to be reasonably easy to lift in and out of the car. If you consider that 44 pounds is the typical weight of a piece of a full suitcase, you will see that a jack weighing up to 45 pounds is reasonably easy to carry in and out of a car boot. The Liftmaster Hydraulic Floor Trolley and the Pro-Lift F-67 are both suitable in such cases. If you are needing a new jack for Garage use, the Arcan XL20 or the Pittsburgh Automotive 3 would be more suitable. 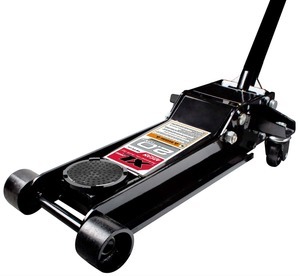 The JEGS Performance products 80006 is also best suited to garage use, but with a weight of about 50 lbs could also be carried about in a pickup. It is certainly capable enough to lift a pick-up when needed. This is clearly is an important criteria, because if you have a very low car and the jack won’t slide under the car, it is then quite useless to you. So, it is essential to check out the minimum height your chassis reaches above the ground without inflated tyres. Some cars such as some Mazdas and some Minis are extremely low. The Arcan XL20 has a pretty good lift range, but so do the Pittsburgh Automotive 3 and the JEGS Performance Products 80006. If you are to be lifting higher chassis cars you also want to be sure that the jacks can handle this. All these three jacks have that capability, generally speaking, but before buying check against the specifics of your car. Higher quality and capability is usually reflected in a higher price. 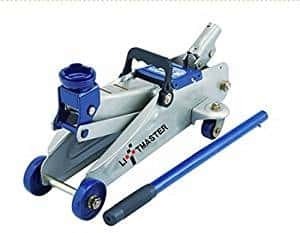 If you only want to have a low profile jack in your vehicle at all times to use, instead of one of those awkward old style jacks when you have a puncture, then the Liftmaster Hydraulic Trolley is probably adequate for your needs as long as the lift range is compatible with the vehicle(s) on which you want to use it. If you need a higher lift range, then the Pro-Lift F-767 is perhaps better matched to your purpose. Professionals and semi-professionals will need to focus on the higher priced models. Again, we need to think about intended use and frequency of use. Is it a tool that will be handy to have to be used once in a while or do we want to be able to get quickest and most reliable use on a daily basis? It is easy when focussing on purchases that we are contemplating making, to forget about safety issues. Throughout the article we keep mentioning the weight of the equipment. That is because it is important that the weight is right for you. If you are going to be carrying it with you for emergency use, you want to be able to carry it comfortably without strain not struggling to lift it in and out of the car. Remember we are looking at a useful tool not a flashy status symbol. If you are rushing around trying to get mechanical jobs completed as quickly as possible, you want to be able to maneuver the jacks easily and you want to be able to pump up the cars off the ground without strain. Good pump action and long handles for better leverage are good points to consider here. If a job requires jack stands, use jack stands. Don’t try to cut corners and take unnecessary risks. Think also about how easy it is to wheel the jacks around. In a busy garage you want to be able to wheel them around smoothly and easily so that you don’t go knocking into things. So, what are the best low profile jacks? The best low profile jack for you is the one that best suits your needs. Your comfort level as regards weight, your car, your requirements. In this article we have given you a selection of different low profile jacks and have tried to guide you to the one that is best for you. We have highlight the different considerations that you need to keep in mind when looking for your new equipment. Whatever your needs there will be a “best low profile jack” for you but take your time and don’t rush into the decision. Happy shopping.